Pluto used to be the smallest planet in the Solar System, but now it isn’t a planet any more, thanks to a recent decision from the International Astronomical Union. But now it’s one of the largest dwarf planets, so that’s a good thing. How big is Pluto? The diameter of Pluto is only 2,390 km across. Just for comparison, that’s about 70% the diameter of the Moon. And it’s a fraction of the size of the Earth; about 18% of the Earth’s diameter. In terms of volume, Pluto only has 6.39 x 109 km3. That sounds like a huge number, but it’s only 0.59% of the volume of the Earth. In other words, you could put almost 170 objects the size of Pluto inside the Earth. The mass of Pluto is 1.3 x 1022 kg, which is only 0.2% the mass of the Earth, or 18% the mass of the Moon. Needless to say, Pluto doesn’t have very much mass at all. The surface area of Pluto is 1.67 x 107 square kilometers. That’s only 3.3% the surface area of Earth, and about the same surface area as Russia. If you could stand on the surface of Pluto, you would experience only 6.7% the gravity you enjoy on Earth. We have written many article about Pluto for Universe Today. Here’s an article that explains why Pluto isn’t a planet any more, and here are some interesting facts about Pluto. Want more information on Pluto? Here’s Hubblesite’s News Releases about Pluto, and here’s a link to NASA’s Solar System Exploration Guide to Pluto. We’ve recorded an entire episode of Astronomy Cast about Pluto and the rest of the icy outer Solar System. You can find it here. 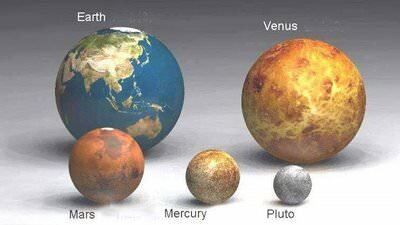 It is often difficult to grasp just how large the planets actually are. There are a number of ways to measure a planet, including diameter, volume, and surface area. Mercury is the smallest planet in our Solar System since Pluto was demoted to a dwarf planet. It has a diameter of 4,879 km, and a surface area of 17.48 x 107 km2, which is only about 11% of Earth’s surface area. Mercury’s volume is even smaller in comparison at 6.083 x 1010 km3, which is only 5.4% the volume of Earth. Venus is similar in size to Earth, which earned it the title of Earth’s twin. Venus has a diameter of 12,100 km and a surface area of 4.6 x 108 km2. These measurements are 95% and 90% of Earth’s diameter and surface area respectively. With a volume of 9.38 x 1011 km3, Venus’ volume is 86% of Earth’s. Earth has a diameter of 12,742 km and a surface area of 5.1 x 108 km2. Its volume of 1.08 x 1012 km3 gives the planet the largest volume of any of the terrestrial planets. Mars is also a small planet, the second smallest in our Solar System. 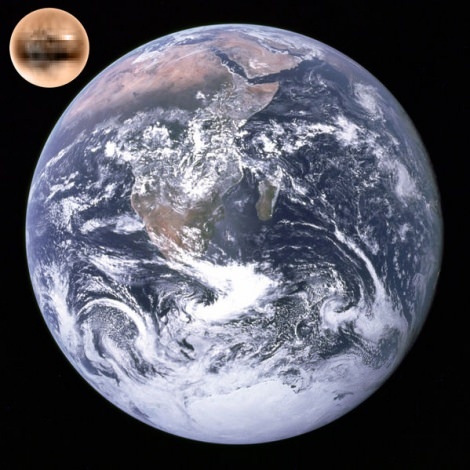 Mars’ diameter is 6,792 km, only about 53% of Earth’s diameter. At only 28% of Earth’s surface area, Mars has a very small surface area of 1.45 x 108 km2. Mars’ volume of 1.63 x 1011 km3 is only 15% of Earth’s volume. All of the gas giants are larger in size than the four inner planets. Jupiter is the largest planet in our Solar System. It has a diameter of 143,000 km, which is more than 11 times the size of Earth’s diameter. The numbers only get larger from there. Jupiter has a surface area of 6.22 x 1010 km2. That is 122 times greater than Earth’s surface area. Jupiter’s volume of 1.43 x 1015 km3 is an incredible number. You can fit 1321 Earths inside Jupiter. Saturn is the second largest planet in our Solar System. It has a diameter of 120,536 km across the equator, and a surface area of 4.27 x 1010 km2. With a volume of 8.27 x 1014 km3, Saturn can hold 764 Earths inside. Uranus has a diameter of 51,118 km and a surface area of 8.1 x 109 km2. Although Uranus is much smaller than Jupiter, it is still large. With a volume of 6.83 x 1013 km3, you could fit 63 Earths inside the gas giant. Neptune is slightly smaller than Uranus, but still very large. The planet has a diameter of 49,500 km. You could fit 57.7 Earths inside Neptune, which has a volume of 6.25 x1013 km3. Neptune has a surface area of 7.64 x 109 km2, which is 15 times Earth’s surface area. We have written many interesting articles about the Solar Planets here at Universe Today. Here’s tWhat are the Different Masses of the Planets?, What Is The Atmosphere Like On Other Planets?, What is the Average Surface Temperatures of the Planets? and What are the Diameters of the Planets? For more information, check out this website to learn all about the planets and this page from NASA to learn about the planets. Astronomy Cast has an episode on each of the planets including Mercury.